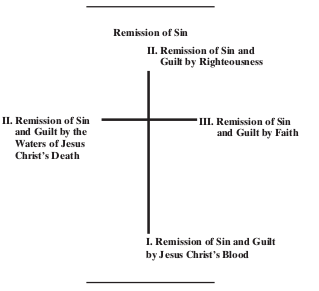 God’s Word uses the pattern of the Cross to show a complete picture of a Spiritual Truth; therefore, in our study about getting rid of our guilt through the remission of sin, we see four major points, which fit with the four points of the Cross. Four different words in the Scriptures refer to the remission of sin. Each of the four words pertains to a different aspect or Work of Remission. The Hebrew word for remission means to carry away, to send forth. The Greek word for remission, which also means to carry away or to send forth, is akin to the Hebrew word which means scapegoat in the Old Testament. mend God’s Word that was and is broken by sinful man. However, only a portion of Christ’s Blood was used for forming a part of the River for Remission of man’s iniquities, transgressions, and sins.